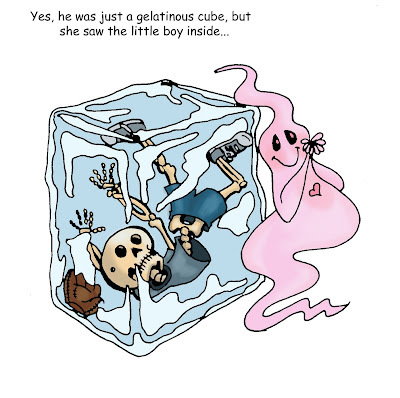 Who doesn't remember their first encounter with a Gelatinous Cube? In my case, our DM misled the group into believing that a Spectre was floating down the hallway toward our group. Most of us panicked, as we lacked magic weapons, but our Paladin charged the foul "undead" creature. He had faith in his magic weapon, the only magic weapon in the group, it was his screams of "it burns, it burns!" that signaled that something else was up. Okay, now, that's an actually FUNNY fantasy gaming cartoon... I laughed out loud!